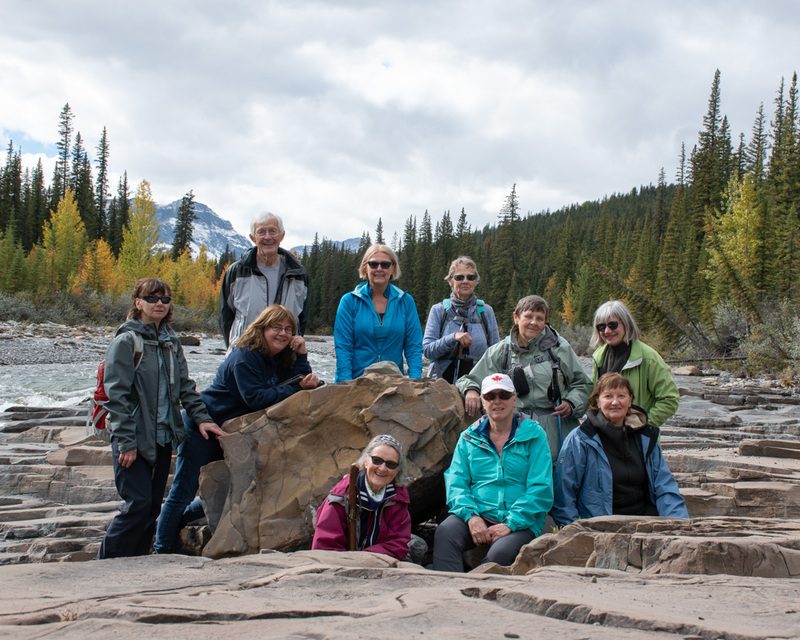 Our first group activity for the eleven of us (Elizabeth was arriving later) was the rest stop and coffee break near Gull Lake on Highway 12. Anita introduced us to The Wooden Shoe, a combination Dutch import shop and coffee shop. 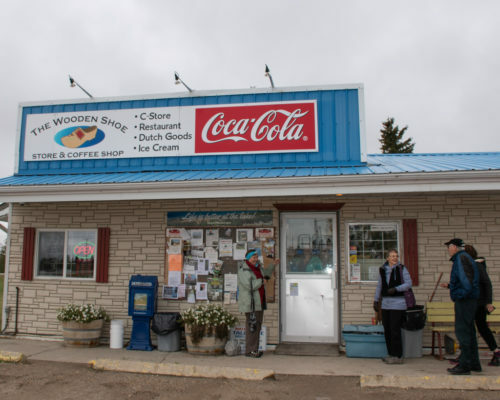 On the dining side, Dutch memorabilia, such as a display of antique wooden clog-making tools from the Netherlands, hang on the walls and in the corners. (The breakfast menu board advertised the Indonesian specialty “Bahmi with an egg and rice”.) Delicious pour-yourself coffee, rhubarb pie, ice cream, and stroopwaffles (from the grocery side)—what a way to start a Beyond Event! Onward to Nordegg. We had been having rain and snow for five days and the gloom had been wearying. So, when we turned the bend and the sun broke through at the very same time that we came into view of the mountains, we were ecstatic. Just past Nordegg, we got out at the Dry Haven campground to have our lunch. 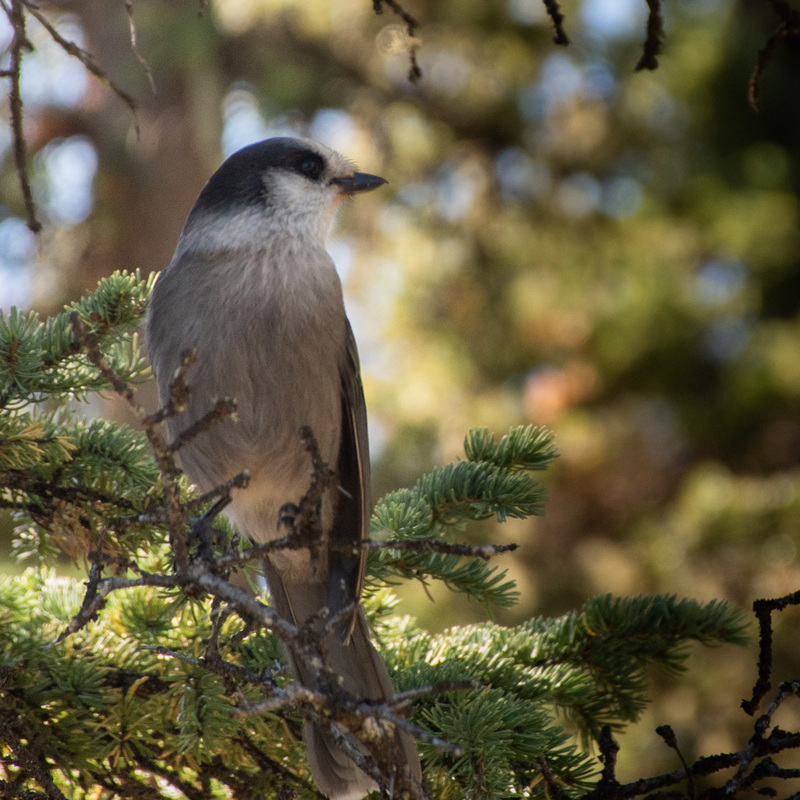 Within minutes, the Whiskey Jacks (aka grey jays, camp robbers,…) arrived to see what snacks we would drop on the ground. Then it was on to Crescent Falls—perhaps the most famous of the hikes in the Nordegg area. It’s an easy walk along the top of the Bighorn River canyon, along the edge of the typical spruce forest in this montane landscape. The ground is covered in moss, kinnick-kinnick, and some astonishing specimens of fungi that we haven’t yet found in the mushroom guide book, such as the two-inch “pipes”. Half way along the trail we came into view of the spectacular falls. 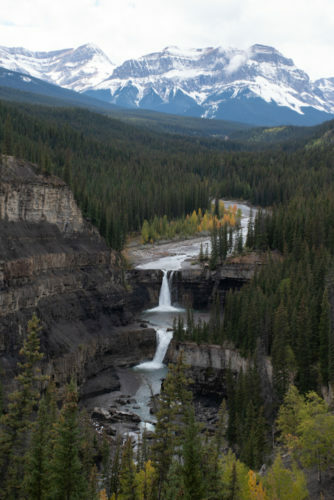 There are two falls, actually, like a horizontal double exposure. The trail continued down to the top of the upper falls, where the broad rock surface tempts you into stretching out and relaxing for a while. We could have lingered longer, especially once the golden rays hit the snow-covered mountains in the distance, but we needed to head over to the Goldeye Centre and check in so that we could get ready for supper. We dined on a classic steak and baked-potato meal with accompanying vegetables and salad bar. Dessert was show and flavour—a dense chocolate-orange brownie Black Forest-style, i.e, with whipped cream and cherries. After dinner, we congregated in the lounge of our wing, which we had all to ourselves. Six of us gathered around a coffee table with a deck of cards for a raucous game of Golf, while the rest took to our novels, journalling, and photo-editing. Here is today’s group photo. There are many more on Flickr.